Our goal is to provide professional and reliable service and maintenance for your property. We can help your home or business achieve the updated look you’ve been looking for. The premier roofing company serving the Charlotte metro area. When it comes to Charlotte roofing, Time to Roof is a great place to start. We’ve been installing and repairing both residential and commercial	roofs for more than 20 years. Along the way, we’ve seen plenty of	other roofers come and go. What has been the key to our longevity? Reliable,	professional service and high-quality products. To see what we mean, give	us a call at (980) 722-2759 for a free estimate. What Should I Look For in a Charlotte Roofing Company? When evaluating the merits of any builder or contractor, it’s important	to consider their qualifications. You want to make sure you are trusting	a roofing company that is properly accredited, licensed, bonded, insured	and warranties their work. At Time to Roof, the answer to all of these	questions is a resounding “yes.” We are licensed by the state	of North Carolina, have received an A+ accreditation from the Better Business	Bureau (BBB), and maintain membership in the National Association of Remodeling	Institute (NARI). We have commercial and residential referrals available	for the asking; all you need to do is call. Advanced Roofing Solutions Increase Both Comfort & Efficiency! 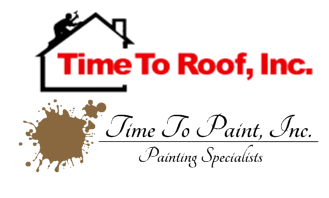 Time to Roof has extensive experience in all roofing materials, including	an array of leading-edge solutions like Fluid Applied Sustainable Cool	Roof Systems (FASCRS) and PremiumCoat® sustainable roofing. You’ll	also find that we can waterproof just about anything, from exterior walls	to concrete and wood. Whether your Charlotte roofing needs call for something	as traditional as shingles or as advanced as elastomeric compounds, it’s	time to talk to us at Time to Roof! To get started,	call us today at (980) 722-2759 and receive a free estimate.